The Testing was one of those sheer brilliances of a book that really tests your ability to not take your eyes away from the pages until you've finished. I read every page slowly, taking the novel in a little better by putting my full attention on the new, dystopian world. Yes! What seems like a "Hunger Games" type read was surely not like it at all. 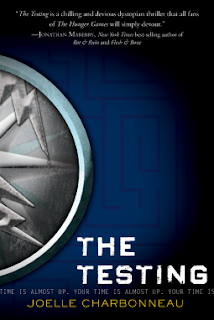 In The Testing, there exists Cia who is the lead character; brave and unique in her characteristics. The dystopian world that the book is set in is probably one of the most thought and planned that I had read compared to the likes of The Hunger Games and Divergent. I really loved the whole dynamics of the plot with it's twists and turns--of course, I kind of plotted that there would be a certain romance and adventure, but nevertheless, it wasn't "predictable", in fact, it was more surprising and left me wanting there to be another book right after the last pages (I hope there is?!) and so The Testing became another loveable dystopian novel that I will always treasure. I mean, Joelle's descriptive writing of The Testing really roped me into the story-world and I felt more connected to the characters and events that were occurring. Trust me, you won't want to take your eyes away from the pages! Seriously, since I started reading one afternoon, it became apparent that I was going to finish this no matter what...and I was positively sure I was going to adore it. And I sure did. 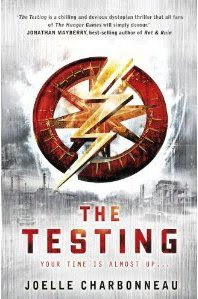 A really HUGE thanks to Netgalley and Houghton Mifflin Harcourt for the copy of "The Testing" and I'm going to want to buy the hard-copy as soon as it hits shelves in the UK on June 4th! Stay tuned for a blog tour I'll be involved in on May 31st with my very first giveaway! So make sure you come back on the date above for your chances to win big!